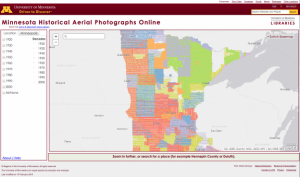 "For readers with a connection to the Gopher State, the University of Minnesota offers this interactive map of historic aerial photography dating from the 1920s through the 2000s. In total, the map hosts over 100,000 photographs from the John R. Borchert Map Library. To explore this map, visitors can zoom in on any area of the state that is of interest. When they do, they will see each aerial photograph as a dot. Each dot is color-coded according to decade. Visitors may also filter results by decade via a panel on the left-hand side of the screen. Users may also search the map (for example, by zip code or the name of a city). Collectively, these images provide a glimpse into the history of Minnesota." [MMB] -- -- The Scout Report, 23 March 2018, Volume 24, Number 12.